Oh my gaaaaaaaaaahd, Tammy Baldwin! Is anyone else out there anxiety-pacing all-day all-night because you just want Tammy Baldwin to win so bad? 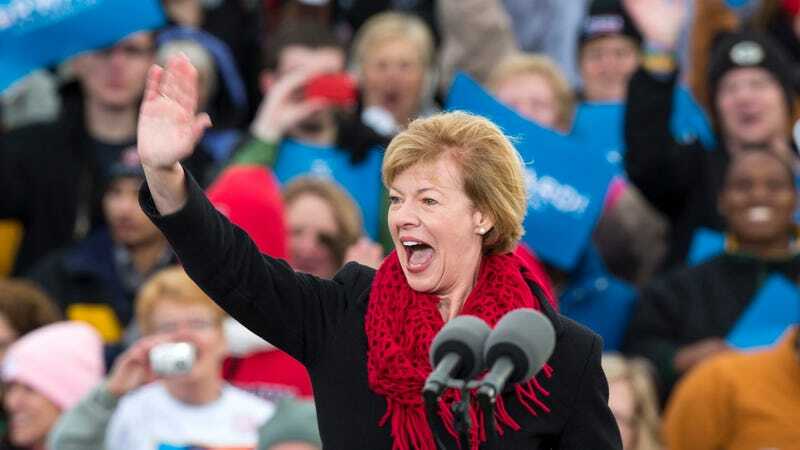 Can't you just taste a Tammy Baldwin victory? (It tastes like blueberry muffins!) Baldwin is in a dead heat with Republican Tommy "Tom-Tom the Tomahawk" Thompson (hot-button issues: alliteration, eyebrows), with both candidates currently tied in the polls after months of record-breaking campaign spending. Baldwin is hopeful that actual voting numbers will skew in her favor: "It's going very well," she told the Guardian. "There is momentum with us and I don't think the polls have picked up on this all over the state." So, we won't know until tomorrow whether or not Tammy-B will become our first openly gay senator. But on the bright side: The polls have already closed in the race for Most Openly Inspirational Tear Factory, and TAMMY BALDWIN WON BY A LANDSLIDE. Here she is talking about how dreams DO come true, little unicorn! Sob. I would also like to say that Tammy Baldwin is my friend's cousin and it is probably my #1 favorite name-drop. And I thought you guys might feel me on that. Because Tammy Baldwin.